AMD Ryzen R5-3550H 2.1GHz. AMD Radeon Vega RX560X 4GB. 8GB DDR4 1TB HDD. 8GB DDR4 2400MHz. It exceeds expectations, boasting impressive hardware and a compact, aggressively-designed chassis that's exceptionally tough. Processor AMD A6 AMD a6-9220 dual core processor. Storage Capacity 1TB. Graphics Type Integrated graphicsintegrated AMD radeon r4 graphics card. Storage Drive HDD storage. Native Resolution 1366 x 768 pixels. 120 GB SSD. 8GB ram Dual core AMD-A6 2.70GHz processor 64bit result in fast and powerful laptop. Ram reader. may have minor scuffs on the casing(pictures for more information). VGA / hdmi ports. 1TB 256GB. AMD R5-1600. Recovery Partition Original Boxing What’s in the Box. USB, WIFI, Webcam. Ports & Extras RADEON RX 580. Microprocessor AMD Ryzen™ 5 2500U Quad-Core (2 GHz base frequency, up to 3.6 GHz burst frequency, 6 MB cache). Still £649 for sale in Currys. Video graphics AMD Radeon™ Vega 8 Graphics. Still in HP warranty by serial. SSD/MSATA/eMMC: 256GB SSD. On-Board Graphics: AMD Radeon 530 2GB Dedicated Graphics. Model: AMD A9-9425. Capacity: 8GB RAM. Discrete Graphics: None. AC Adaptor Provided: Yes. Pointing Device: Touchpad. Condition - screen and keyboard in good condition ,visible scratches on the case. 240GB Sandisk Plus SSD. AMD Quad-Core A10-5750M APU with Radeon HD 8650 Graphics (2.5 GHz, 2 MB cache). AMD A76M FCH. AMD Radeon HD 8570M Graphics (2 GB DDR3 dedicated). 4 USB 3.0 (1 HP USB Boost). HP Imagepad with multi-touch gesture support. Equipped with AMD RX560X 4 GB graphics; ideal if you play FORTINE; League of Legends; DOTA 2; Rainbow Six Seige; Counter: Strike; Overwatch; Rocketleague. ASUS HyperCool technology comprises of the Anti-Dust Cooling (ADC) system and Fan Overboost technology to ensure cooling during gaming marathons. Processor Family AMD Ryzen 5. Graphics AMD Radeon R5 Series. Graphics Detail AMD Radeon RX 560X 4G. Laptop Type Gaming. Cooling Technology Type Acer CoolBoost. Storage Capacity 1TB. Gaming Laptop Yes. Lenovo G505s Gaming Laptop. Processor AMD A10 5750M Quad Core 2.5 GHz Turbo up to 3.5 GHz. AMD Radeon 8570M 8650G Graphics Card. 1000 GB HDD Storage Hard Disk Drive. Four Cores Can Handle up to Four Threads in Parallel. AMD Radeon R5 Graphics Card. Processor AMD A8 6410 Quad Core 2 GHz Turbo up to 2.4 GHz. Lenovo G50-45. Gaming Laptop. 500 GB HDD Hard Disk Drive. Four Cores Can Handle up to Four Threads in Parallel. Full formatted and ready to go. 2 x AMD® Radeon® R9 M290X - 4GB DDR5 Video RAM - DirectX® 11. 32GB KINGSTON HYPER-X GENESIS 1600MHz SODIMM DDR3 (4 x 8GB). GIGABIT LAN & KILLER™ 1202 WIRELESS GAMING 802.11N BLUETOOTH 4.0. Internal 9 in 1 Card Reader (MMC/RSMMC/SD: Mini, XC & HC/MS: Pro & Duo). AMD Ryzen R5-3500H. AMD Ryzen R5-3500H Picasso. 8GB DDR4 2400MHz. It exceeds expectations, boasting impressive hardware and a compact, aggressively-designed chassis that's exceptionally tough. Infused with the spirit of The Ultimate Force (TUF), FX505 passes a series of rigorous MIL-STD-810G tests. Lenovo Z50-75 15.6". AMD FX-7500. 1x Lenovo Z50-75. As part of the sale you"ll receive. Processor AMD A10 7300 Quad Core 1.9 GHz 10 Cores 4 CPU 6 GPU Turbo up to 3.2 GHz. AMD Radeon R6 Graphics Card. Lenovo Z50-75. Gaming Laptop. 1000 GB HDD Storage Hard Disk Drive. Four Cores Can Handle up to Four Threads in Parallel. 500 GB SSHD Storage Upgraded. Experience the perfection of SSD and HDD in one easy to use drive designed to adjust to your needs. HP ProBook 645 G1. This ProBooks is thin, light and a great value. Processor AMD A6 4400M Dual Core 2.7GHz Turbo up to 3.2 GHz. 1TB SSHD (Solid State Hybrid Drive). Experience the perfection of SSD and HDD in one easy to use drive designed to adjust to your needs. SSHD (Solid State Hybrid Drive). HP ENVY 15-j151sa. AMD Quad-Core A10-5750M APU with Radeon HD 8650 Graphics (2.5 GHz, 2 MB cache). CLEVO P170HM3. AMD HD7970M GPU ( Maximum upgrade ). 120HZ FULL HD SCREEN. Great for gaming and 3D work. Entire laptop has been cleaned out. AMD A10-9620P. HP 15-bw094na 15.6". 1x HP 15-bw094na. As part of the sale you"ll receive CCTV & DVR. Lenovo z50-75-80ec 15.6". AMD A10-7300. 1x Lenovo z50-75-80ec. As part of the sale you"ll receive. AMD Ryzen 7 2700U Quad Core Processor. On top of that it boasts fast SSD storage. Amazing Performance At the heart of K570 features the incredibly powerful AMD Quad Core Ryzen 7 2700U processor for effortless multitasking and Nvidia GeForce GTX 1050 gaming-grade graphics for flawless visuals. AMD Quad-Core A10-9600P (2.4 GHz, up to 3.3 GHz, 2 MB cache). AMD Radeon™ R5 Graphics. HP Notebook - 15-ba016na (ENERGY STAR). Optical drive. No scratches, No dead pixels. Fully working. BIOS Checked. Microprocessor:AMD Quad-Core A6 APU ( 2 GHz, up to 2.4 GHz, ). AMD Radeon R4 Graphics Card. Gaming Laptop. Processor AMD Quad-Core A6-7310 APU APU 2 GHz Turbo up to 2.4 GHz. HP 15-ba077sa. From typing essays to browsing the web and streaming films, you can work through all your daily tasks quickly and efficiently. Not Included. (See pictures). no marks or scratches. Grade A (AS new) condition. No scratches, No dead pixels. Fully working. BIOS Checked. Tests and Condition. Graphics Card 2GB AMD® Radeon® HD 6990M - DirectX® 11 (17.3" Vortex II). Network Facilities GIGABIT LAN & KILLER™ 1102 WIRELESS 802.11N - IDEAL FOR ONLINE GAMING. Chassis & Display Vortex II: 17.3" Glossy Full HD LED Widescreen (1920x1080). Massive Maxed out 32GB of 1600 MHz DDR3 DRAM ,512 GB of SSD Sata storage plus an extra 1TB SSHD for Fast extended capacity. Dual Crossfire linked Dedicated AMD Radeon HD 6970M x2 graphics processor with 2GB GDDR5. Processor: Intel Core i7 Extreme 2nd Gen.
AMD Ryzen 5 3550H Quad Core Processor. Processor AMD Ryzen 5 3550H Quad Core (2.1GHz, 6MB Cache, 3.7GHz Max Boost Clock). 1000GB FireCuda Hybrid SSHD. ASUS TUF Gaming FX505DY-BQ008T. Hard Drive 1000GB (5400rpm) SSHD. AMD Ryzen 5 3550H Quad Core Processor. Processor AMD Ryzen 5 3550H Quad Core (2.1GHz, 6MB Cache, 3.7GHz Max Boost Clock). 1000GB FireCuda Hybrid SSHD. ASUS TUF Gaming FX705DY-EW003T. Hard Drive 1000GB (5400rpm) SSHD. AMD Ryzen R5-3550H 2.1GHz. AMD Radeon Vega RX560X 4GB. 16GB DDR4 2400MHz. It exceeds expectations, boasting impressive hardware and a compact, aggressively-designed chassis that's exceptionally tough. AMD Ryzen 5-3550H Processor. Processor: AMD Ryzen 5. Processor Speed: AMD Ryzen 5-3550H, 2.1GHz. AMD Radeon RX 560X (4GB) Graphics. The ASUS TUF Gaming FX505 will exceed your expectations finished off in an aggressively designed chassis that is super tough. Total Hard Drive Capacity. Solid State Drive. Optical Drive Type. no marks or scratches. Grade A (AS new) condition. No scratches, No dead pixels. Fully working. BIOS Checked. AMD A6-7310 APU with Radeon R4 Graphics @ 2.0GHz. AMD Radeon R4 Graphics. Asus laptop in good condition with few usage signs including scratches on the lid, slight discolouring on palmrest edge and slight white mark on the screen (all tried to show in pics) / fully working no issues. Designed for high-end multimedia performance, AMD gaming laptops have either both graphics cards and a processor made by AMD or, in some cases, just the graphics card. Based in California, Advanced Micro Devices (AMD) has built a reputation for computer components and cards that offer high levels of performance for modern gaming. Although an AMD gaming laptop may be optimised for gaming, few serious gamers would consider any laptop to be quite as good as a top-end tower PC. What are the key characteristics of an AMD gaming laptop? Backlit keyboard using LED technology. A large amount of RAM to keep games running smoothly. Graphical double data rate (GDDR) memory built into the graphics card for exceptionally clear visuals. What are the standard features of an AMD gaming laptop? As well as all of the high specification components that are associated with fast-moving games, a typical AMD laptop has plenty of standard features. These include an Ethernet port, a number of USB3 ports, a twin headphone and microphone jack and an HDMI output so you can connect your laptop to a monitor system. Most will also offer a scratchpad with a couple of buttons that you can use rather than plugging a mouse in. Which AMD graphics card should you look out for? There are a number of different graphics cards that AMD has built for gaming laptops over the years. Among them, the Radeon RX 580 graphics card has set the standard in many gamers' eyes, especially one that is fitted with at least 8GB of GDDR5 dedicated memory. AMD's graphics cards frequently feature innovative technologies, such as Mantle, a software suite for game developers, or Eyefinity, which blends existing display combinations seamlessly. 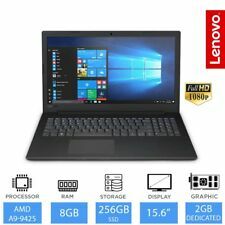 Why buy a refurbished AMD gaming laptop on eBay? There are plenty of new and refurbished AMD gaming laptops available on eBay. Although a brand new one is often preferable for dedicated gamers, you can purchase a gaming laptop with great specifications for your budget if you opt for a refurbished one. Content provided for informational purposes only. eBay is not affiliated with or endorsed by AMD.